If you’ve ever had a bite to eat at a college campus, corporate office, or major event such as the US Open or Academy Awards®, chances are that you already know Compass Group. 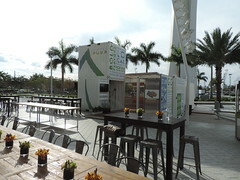 That’s because the global foodservice company serves eight million meals a day from vending and office coffee solutions to restaurants, corporate cafes, schools, arenas, museums, and more places people congregate. 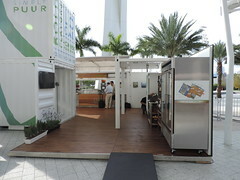 This past February, Compass Group hosted ‘Envision 2020’ at Marlins Park in Miami. The summit was attended by corporate leadership to discuss the company’s commitment to great food and service. With consumers demanding healthier, more locally sourced foods, the summit focused on creating revolutionary dining experiences. 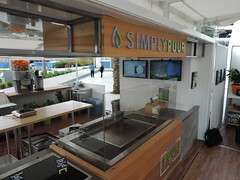 One such experience was built by Boxman Studios to promote ‘Simply Puur’, a retail and dining experience unique to Compass Group that meets customers’ demands to have access to delicious, wholesome and responsible dining that incorporates ingredients so local that some are even grown in the kitchen. We built the ‘Simply Puur’ experience from three of our existing assets. 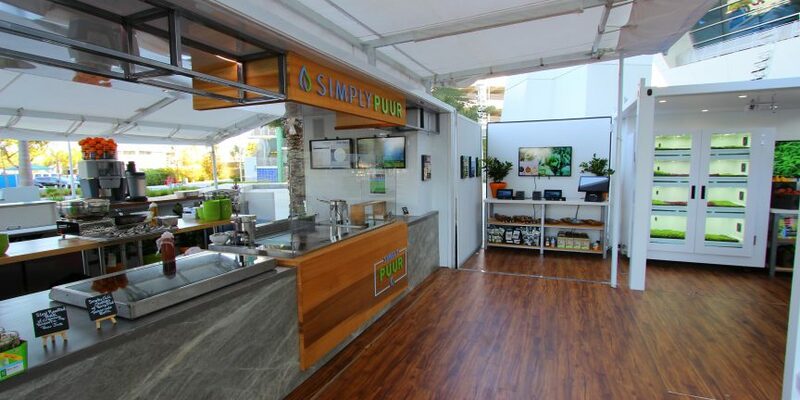 First, we transformed a 20’ suite into a kitchen, created a 10’ space for display and retail, and erected a 20’ tall element for use as a vertical garden. Using various architectural elements, like additional decking pieces and fabricated pallet walls, the three structures created one seamless experience. 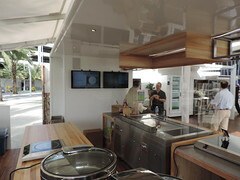 We modified our standard 20’ suite to create a kitchen and serving area. 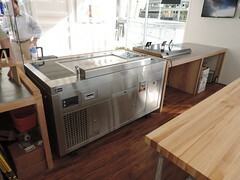 The kitchen boasted state-of-the-art equipment with four TV screens for interactive menus and ordering. To achieve the concept’s sleek, modern feel, we fabricated waterproof counters wrapped in flexible porcelain tile sheets, and subway tiling mounted with rubberized grout to prevent cracking or breaking during transport. Cedar accents were used throughout the furniture and equipment. 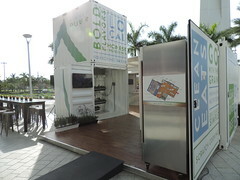 The retail and walk-through area of the experience was the first project to use of our newest 10’ structure. It features a 10’ x 8’ structure that opens up to reveal three fold-down walls, and two swing doors for interactive displays and other tech, expanding to nearly 450 square feet. 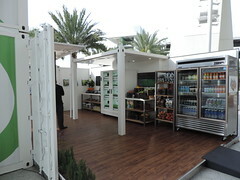 We fabricated steel and cedar shelving for snacks and produce. 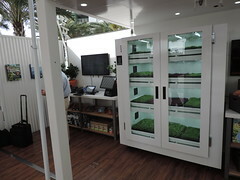 We also installed drink coolers, and the Urban Cultivator: an automated indoor growing appliance that creates perfect growing conditions for herbs and microgreens. 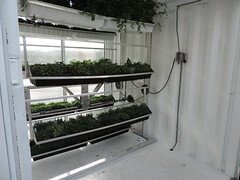 This amazing activation also marked the debut of our Vertical Garden. Built from two 10’ structures stacked on top of each other, one wall from each container was replaced with greenhouse grade plexiglass that harnesses sunlight. Inside we custom-manufactured a chain-driven carousel with an aluminum frame and a central motor. 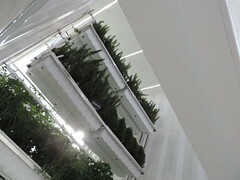 The bottom level of the Vertical Garden features an area for cultivating the produce from the 48 trays that create 96 sq ft of growing space, resulting in incredible efficiency out of a minimal footprint. The final product was a true marvel, and showcases that with a little innovative thinking, we can change the way we source our food. We’re grateful to Compass Group for this opportunity to change lives and promote healthy living. We’re excited about building more structures like this one in Compass partner facilities around the world.